The Overwatch World Cup Viewer : New Spectating and Replay features. Blizzard Entertainment Vice President Jeff Kaplan released a new Developer Update which highlights a few new upcoming features. One of the features that will drastically change the viewer experience will be the new replay system. One of the features that Overwatch currently lacks when it comes to their game is a live-spectating feature. This feature is something that the developer team has been working since quite some time. To make the experience smoother, they will also allow an ability to watch your previous games via different angles. Players will be able to watch via an overhead view as well as change the corners to get a better macro view of the entire game. There are multiple advantages of a replay system for Overwatch. Just like with most of the other popular esports titles, Overwatch’s new feature [ a replay system ] will be crucial to allow teams and players to develop. Players will be able to watch their matches in their POV as well as with the opponents’ POV. The ability to watch one’s mistakes either in movement and positioning or ultimate usage is crucial. Teams and coaches will have a lot of time to study their mistakes and not just from their POV. You can watch replays of your games and improve your gameplay. A replay system will find excellent usage when it comes to preparing against certain teams specifically. So if you are playing against a Pine Widowmaker you can be better prepared for the extremely risky flanks. 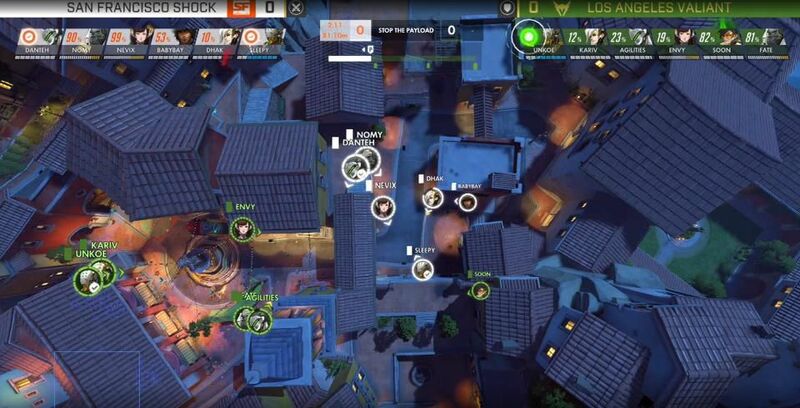 Often, the Overwatch League observers are unable to point out essential character movements in the map. We cannot blame them since they have to find a focus on the eliminations across the map. But subtleties do get lost in the search for obtaining the best viewership experience. The Top Down Feature will be a new way to view the matches In-Game. Overwatch will also feature a live spectating feature for the course of the Overwatch World Cup. Aptly named the Overwatch World Cup viewer, this will be via a unique feature on the Battle.net client specifically for this purpose. Since its available on the Battle.net client, it will be a PC exclusive feature. For Blizzard, this is a trial phase for the live spectating feature. They hope to iron out any kinks and problems in the feature during OWWC 2018. Live Spectating without any delay. All Spectator tools are available at your disposal. You can also watch all the replays at a later date. It will require a special version of Overwatch only available on PC. It allows us to work on the technology that will one day allow us to bring these features to all of Overwatch. The lack of a delay definitely will have unintended consequences for the Overwatch League. We will see several viewers switch to watching the matches live in-client.Viewers flocking to The Overwatch World Cup Viewer will affect the total viewership numbers for the League. For Overwatch World cup, the viewership numbers probably do not matter as much. However, for Season 2 of Overwatch league, a reduction in viewership numbers could spell bad news for the company. In esports, viewership numbers are one of the most significant measurement metrics to gauge the popularity of an esport. Blizzard themselves have hyped the viewership numbers for Season 1, and it will be impossible to stop the comparison between the two seasons. Regardless, we welcome Blizzard’s move to allow for more functionality and flexibility when it comes to viewing live matches. For people who are not on PC or do not want to watch the games In-Game, they can always tune in to one of the Twitch streams. The Twitch streams naturally provide for more content in the form of desk analysis and the casters voices. Busan is the latest new map in Overwatch. For the past two years, Blizzard has unveiled new maps at Blizzcon 2018. We have had map announcements such as Oasis and BlizzardWorld in the past years. These announcements, according to Jeff, get a little bit lost during the shuffle and news announcements at Blizzcon. They did not have a huge impact on previous Blizzcons, especially amidst all the other news content specific to the Overwatch League. The lack of a map announcement does not mean that the developer team is not working on new map content. Jeff confirms that they are actively working on new maps and will announce further details later. In addition to this, there will be a few balance changes in the upcoming weeks. These changes pertain to multiple heroes, but Jeff mentions four heroes in specific. Roadhog, Mercy, Reaper and Symmetra will receive buffs. Mercy will receive a buff to her ultimate movement Valkyrie which will significantly improve the ultimate. It is one of the most underwhelming support ultimates in the entire game and so these changes are exciting. Blizzcon 2018 will take place on November 2 and 3 at the Anaheim Convention Center. It will feature several panels, cosplay competitions as well as the final stages of multiple esports tournaments. The Overwatch World Cup is one of the key competitions at Blizzcon 2018. You can watch the event live with a virtual ticket available here.